Hey, okay, Odiham isn't exactly the center of the known universe, and hardly anyone will need this route, but what the heck. I like the place. Odiham is a little village outside the big city of Hook, in Hampshire, southwest of London. 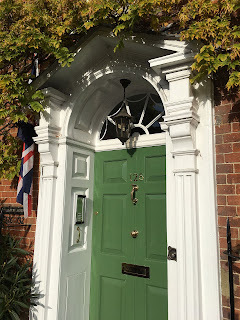 It's one of those typical, beautiful English villages full of gracious old homes, with a 500-year-old pub, a 900-year-old church, a square with stocks (for punishing criminals), and lots of nice countryside all around. There's an RAF base nearby, home to the British fleet of Chinook heavy-lift helicopters. 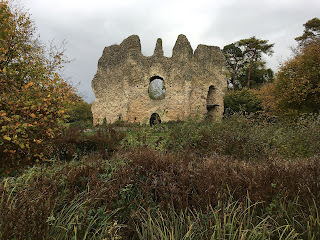 And King John's Castle, a weathered medieval ruins, fills a bend in the River Whitewater. All in all, it's a cool place, and I think you'll like it as much as I did. 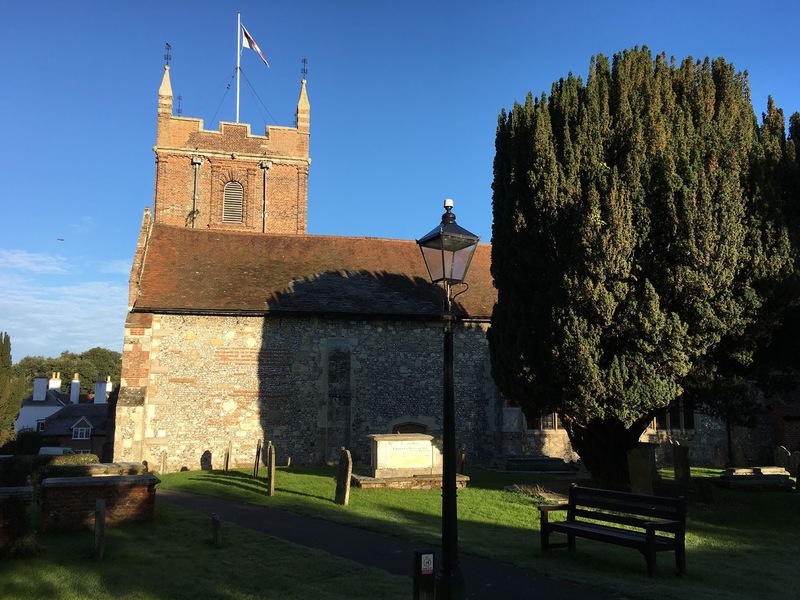 This route will start in the village square, then head eastwards down the main street, will then circle westwards along the Basingstoke Canal to King John's Castle, and finally head back again via some fields and neighborhoods. So, let's get running! Get yourself to the High Street, in front of the 500-year-old George pub, a fine drinking establishment well worth a visit some evening. So now, turn right and head eastwards. Stay on the left side of the street, so that when it forks, you can take the left-hand street, London Road. Some of the houses get more modern here, as you leave the village. 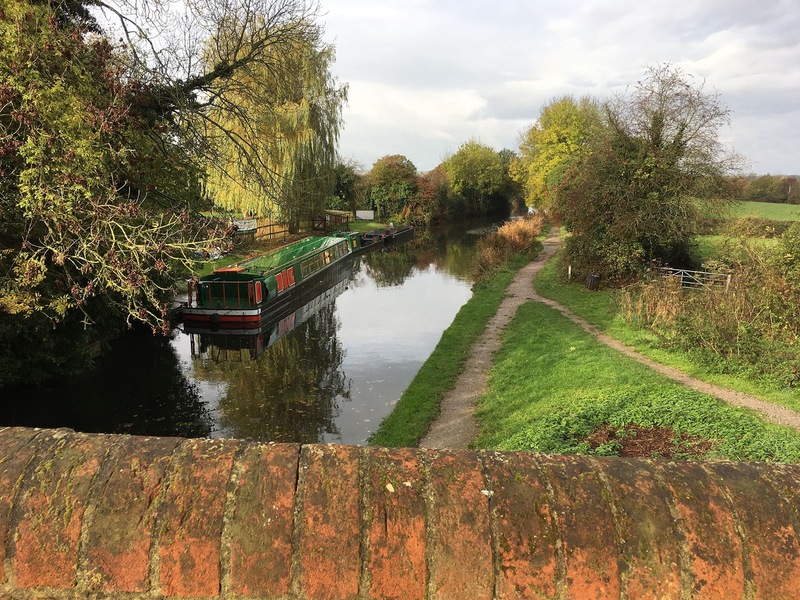 You'll pass the Waterwitch pub, with its dock for narrow-boats that travel along the Basingstoke Canal. Get onto the canal tow-path here! Cross over the canal, then turn left to head north along the canal, at the 1-kilometer mark. Just follow the dirt tow-path along the canal for the next 2.5 kilometers, between the fields. 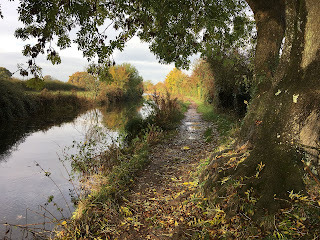 The canal will curve southwards, then westwards again, going under a road bridge. 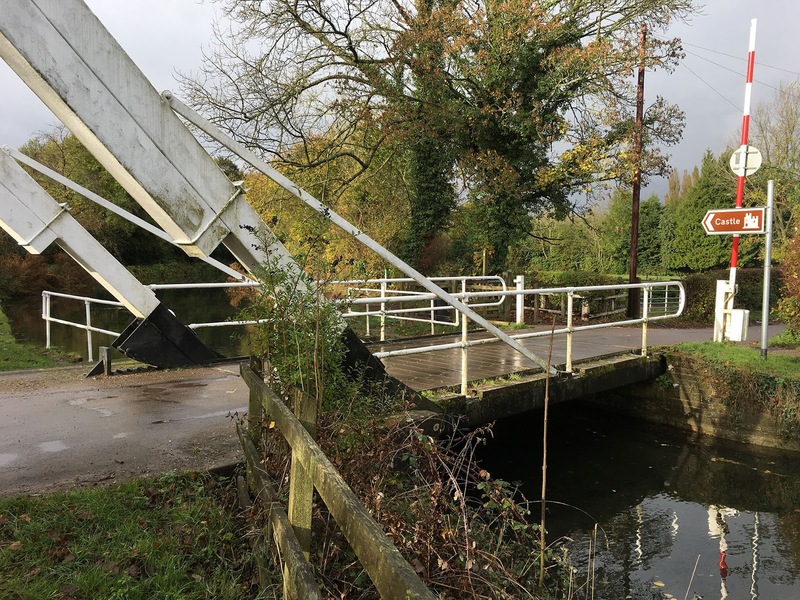 At the 3-km mark, you'll come to a little, white bascule bridge (lifts up like a draw bridge) at Tunnel Lane. Boaters driving narrow boats can lift the bridge so that their boats can go through. Keep running another half-kilometer westwards, and you'll see the ruins of King John's Castle on the right side. King John was crowned after his brother, Richard the Lionhearted, was killed in a crusade. John rode out from here to put his stamp on the Magna Carta, providing the basis of a formal division of powers, the basis of British democracy. There isn't too much of the 800-year-old walls left and it has the look of a weathered termite mound, but is worth circling and viewing close-up. 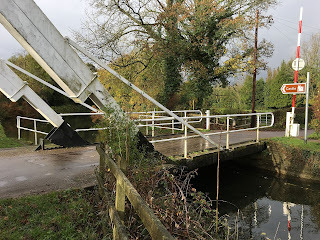 Now head back to the bascule bridge and turn right onto Tunnel Lane, a quiet road between the fields. 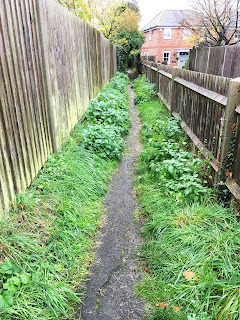 When Tunnel Lane runs into Warnborough Street, turn right and run the block to the Anchor Inn pub, where you turn left to follow the little public footpath between the modern houses, heading southeast. You'll run past Robert May's School. This is the least scenic part of the run, with fences to either side. The footpath then ends at West Street, where you turn left to run the two blocks to Recreation Road. Just run past a few houses and you'll come to the big sports grounds on the left. Turn left just before the grounds and follow that footpath all the way back to the churchyard in Odiham. You're now in the Bury, the town square, with the Bell Inn pub, and the stocks. The stocks have holes in them for criminals' legs, where they were locked and kept on display for the ridicule of the other villagers. 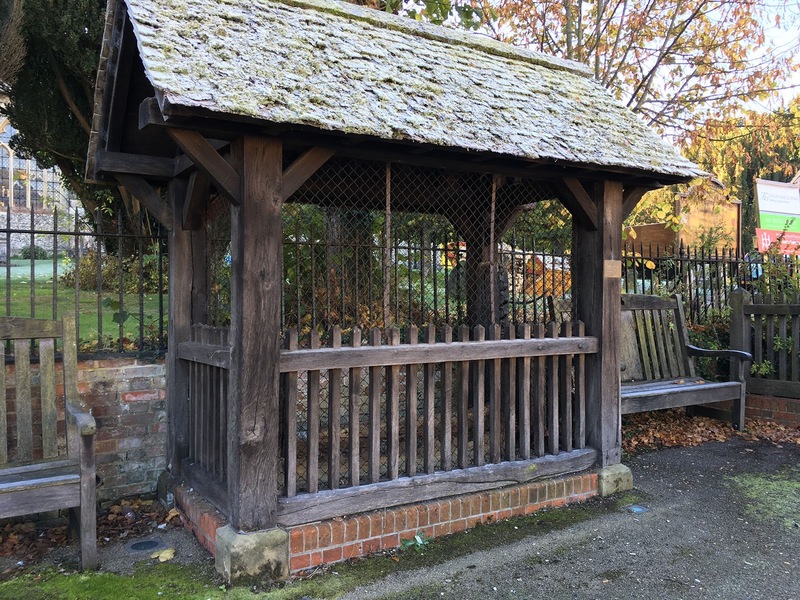 The stocks are now roofed-over, sitting obscurely at the churchyard, but they look solid enough to still be able to handl more local ne'er-do-wells at any time. All Saints Church in the background goes back at least 900 years, surrounded by big yew trees in the graveyard. 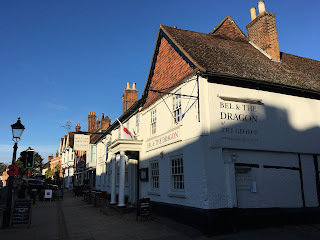 Keep running eastwards and leave the square past the half-timbered houses for one block to King Street, then turn left and run a block to the main street, High Street. The pub is just to your left, past a few interesting antique shops. Now you've earned your dinner in the George or the place next door (actually called Next Door). Enjoy!